After our awesome success with QuonsetPalooza, we couldn’t wait to go back and keep the ball rolling! We got everything organized for our next big push, but ended up having a bit of a false start. The plan was for me to go over to Arizona about a week and a half after our return, by myself, to get a few things done mid-week that didn’t require all three of us. This would let Eric and Steven finish out the regular work week, and then the two of them were going to drive over on the weekend. Then all three of us would work all that following week, with possibly a fourth person joining in as well. Our plan got off the ground reasonably well. I drove over on Tuesday, June 13th. My preliminary tasks, including getting a trench dug (with help from some local experts and their big machines) to connect the Headquarters building’s waste line to the septic system, started coming together. Over the few days that this played out, the temperature climbed into the upper 90’s. This was forecast, and thus not entirely unexpected. The unexpected part was the sheer brutality of the hot sun when you’re trying to work outside at an altitude of 6,700 feet. Then imagine that the work you are doing involves intimate handling of large bare metal parts that have also been in the hot sun all day. It gets pretty unpleasant pretty quick, if not downright dangerous. The forecast for the following week was for the heat wave to continue and even get worse. After a few days of this, with the weekend upon us, it seemed less and less realistic or reasonable to expect our friends to toil on our behalf under such extreme conditions. So, with regret, we cancelled their trip out, and decided that I would finish up a few more key things and head back. Since we already had Kevin our excavator and his crew lined up for Monday to dig our Big Trench, we went ahead and kept him on the schedule, and I stayed over the weekend to work with him on Monday. The Big Trench was planned to run north-south from the electrical main panel at the north end, past both buildings, ending at the cistern on the south end. This would allow us to run electrical conduit from the main panel to both buildings, to run water from the cistern up to the bathroom in the Headquarters, and to connect electricity to the pump in the cistern. The skies were very dark those nights, and before everything got all torn up with the trench digging, I spent a magical evening photographing the semi-completed building shells gleaming under the milky way. I already blogged separately about those images, here. Monday rolled around and the crew got the Big Trench dug without any trouble. I managed to get a few other things done that trip, but the other big event worth recounting here was that it was Daisy’s first trip to the Quompound! It was not her first road trip, but it was definitely her longest car ride ever. She did pretty well in the car. When we got there, she sniffed around a bit and explored the buildings. Pretty quickly though, it became clear that she didn’t like it and wanted to go home. All she wanted to do was hang out in the car. 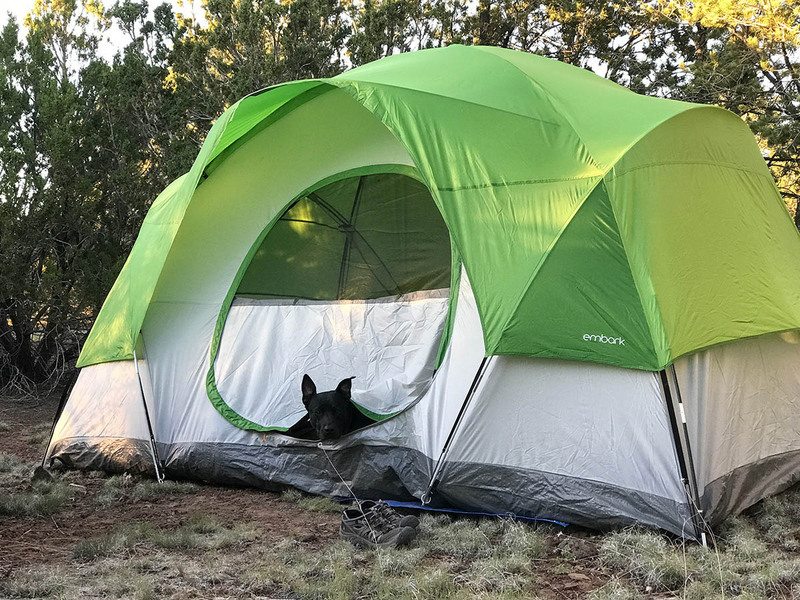 Once I got our tent set up she liked it in there. Here at home she’s really more of an indoor dog, and she definitely liked the enclosed space of the tent. Eventually though, with the crazy heat and little relief from it at the property, I ended up boarding her at the Grand Canyon Pet Resort nearby in Williams. Tuesday morning I picked her up and we headed home. Part of me wanted to stay longer, but a week in the crazy heat was enough. We had originally hoped to get both buildings completed, at least the arches, and possibly some work on the end walls. When I left, it was just piles of dirt everywhere and open trenches. The trenches represented important progress though. Underground plumbing and electrical lines to the buildings aren’t pretty and photogenic, but they’re critical “under the hood” infrastructure. Slow progress is still good progress! Thank you for sharing your experience. We are preparing to start a quonset house also, and I am learning a lot from your blog. Would you please tell us more about the cistern and the water catchment system? Our cistern isn’t connected to a catchment system at this point. We have a cistern because the water table in our area is thousands of feet deep, and wells cost millions of dollars to drill (quite literally – we were told a new well was drilled in our area in the last couple of years at cost of over $3M.) All the water in our part of the county is hauled. We did bury drain lines around the buildings that we can connect to in the future, with gutters along the base of the buildings, to funnel the water to a separate cistern for catchment. Then the captured rain water would be treated and pumped back to the current cistern where it would become part of the potable water system for the property.